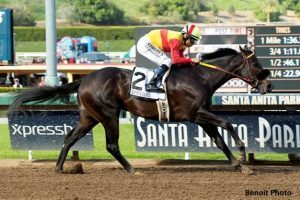 San Miguel, CA (October 19, 2017)- Danzing Candy will standing at Tom and Nancy Clark’s Rancho San Miguel for the 2018 season at a fee of $5,000 live foal stands and nurses, as property of a syndicate. The transaction was brokered between Brett Lindenbaum and Checkmate Thoroughbreds. Multiple grade two winner of three graded races Danzing Candy, a son of Twirling Candy, earned $700,930 with his six wins from eleven starts and is the leading earner of his sire. The four-year-old horse is out of Talkin and Singing (Songandaprayer); this is the female family of $4 million earner Better Talk Now and millionaire Medaglia Beat. Bred by Halo Farms, the colt raced for the partnership of Jim and Dianne Bashor and Halo Farms.